Kat - Most deaths from cancer occur when the disease spreads or metastasises to other parts of the body and we've already discussed about what might be going on at a molecular level, but we don't really know what's going on at a physical level. What does it actually look like? Now, a team from Hubrecht Institute in the Netherlands have developed a technique to allow them to peer into organs within the body and watch metastasis taking place. This gives us really important clues as to how it happens and potentially, a way to find drugs to stop it. We're joined by Dr. Jacco van Reenen. He's one of the scientists behind the work. Hello, Jacco. Kat - So, tell me a bit about why you decided to do this. Why can't we look at cancer spreading right now? Jacco - So, the big problem is that you would like to see which cells are growing out and not. What we did before is, we took for example a biopsy or tissue sections and we just visualised on the microscope and we look through the cells. That gives you just a snapshot, so you can for example see a thousand cells that arrive in the liver, but you have no idea which cells will grow into tumours or not. 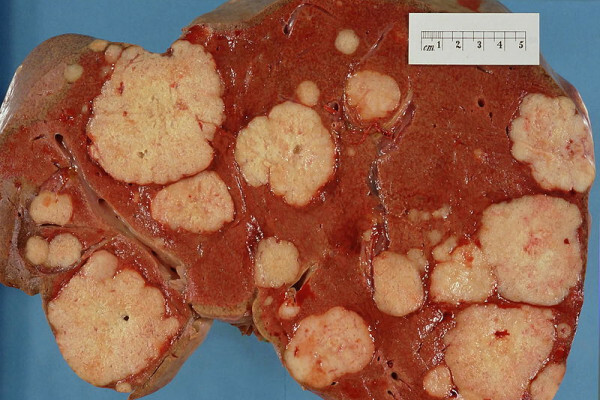 Of course, you can also look at later stages and then you can see the tumours that grew out. The problem there is that you have no idea which cells didn't make it and why they didn't make it. So, what we now did is, we developed a technology where we labelled the tumour cells in mice and we could see on the microscopes how these tumour cells arrive in the liver and how they grow out into a full metastasis. Kat - So this is real-time imaging of cancer spreading. How does it work? How can you actually see into a liver, you're doing this in mice I guess? Jacco - Yes. So, you can just think of an airplane. If you look through an airplane and you would like to see inside the airplane, you do not see anything because the light from within the airplane doesn't penetrate the wall of the airplane. However, if you now go to the little windows of the airplane, you look through the glass, you'll certainly see exactly what's going on there. We do exactly the same, so we invented a little window which is held in a titanium ring with a small piece of glass. And it's very small, but we can implant into the belly of a mouse. Through this little window, we can see what's going on inside this mouse, and we can start really to visualise the individual cells that arrive in the liver and how they grow out. Kat - So tell me about some of the things that you can see through these tiny, tiny windows on cancer. Jacco - So for example, what we observed is that the tumour cells that arrive, not every tumour cell is growing out, but what we observed at the ones that grew out, they leave the blood vessels and they migrate a little bit and then they start to grow. What you would expect is that if a tumour cell starts to grow, you expect a little bowl of cells that is growing and growing, and growing. But surprisingly, what we observed is that the cells that start to appear after a few rounds of multiplications is that the cells do not stick together. They don't form a very dense little bowl, but they more form a larger bowl where the cell density is very low. And then slowly over time, this tumour condenses slowly and if you then visualise over time, then you see the behaviours of the tumour cells in the different stages, in the early stages where the cells are not really connected to each other, they're very motile. We found that if you block this motility, that this really blocks the growth of this tumour into a bigger tumour. Kat - So the key is actually the movement, not just the division or multiplication of the cells. Jacco - Well, we actually observed that these two things are connected. So, if you are able to use drugs that block this movement of these cells, you also block the growth of these cells. And we use drugs that, if we look through cell cultures, if we use this drug you can see that it stops. They still proliferate. If we now look in vivo, inside the mouse and we see at these very early stages and use the same drug, you can see that the cells stop moving, but they also stop proliferating, so it stop growing. Kat - What do you think these experiments could tell us about how cancer may be spreading in humans? Do you have hope that these same drugs or developing these chemicals you're testing into drugs, could potentially stop cancer spreading in humans? Jacco - Well, I think the most important thing is that this is fundamental research, right? So, we have many questions that we just would like to answer. So how is a tumour cell growing to metastases? Our research is just proof of principle, and we see now something new and whether it is holds true in humans, we have to do much more research of course [to find out]. We did just one type of cancer. If you would really want to know what will help in the clinic, you have to find out whether this holds true in many types of cancer. But of course, with this technique and now, our new technology, we have now the ability to really search for drugs that can block potential new drug targets that we could never really look or investigate before. Kat - And finally, how did it feel when you actually got this to work? Jacco - That was really amazing. You just think about it all the time. You really think about static images, so you think that that's a tumour cell and they're just growing, but you have no idea what's going on there. And when I saw that for the first time, that you really see it moving, that you really can see how it's growing, of course, it was very exciting, but kind of terrifying as well because you realise that the mechanism that you see is causing the death of many people. So, scientifically, I was very excited, but as just a human being, it was kind of terrifying as well. Will it ever be possible to revive a cryopreserved human?